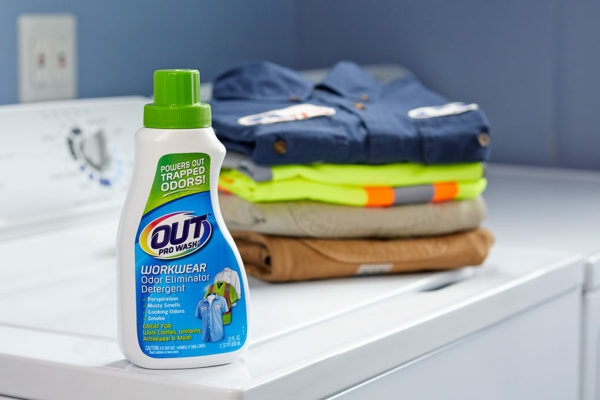 OUT® ProWash® Workwear Odor Eliminator Detergent is specially formulated to remove heavy-duty odors and the toughest stains from hard-to-clean fabrics without sacrificing fabric performance. 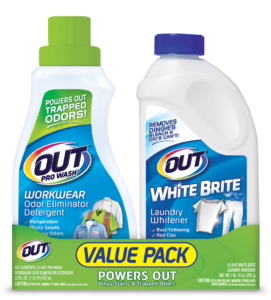 An unbeatable work clothes deodorizer and detergent, OUT’s unique formula reaches deep to power out trapped odors by eliminating the odor, not masking with fragrance. ProWash is ideal for use on work clothes, uniforms, towels, bed linens, pet bedding and more to remove odors and stains caused by perspiration, mustiness, food, smoke, pets and other tough fabric problems. It may also be used as a sport laundry detergent on activewear or difficult to clean fabrics like microfiber. When your regular detergent just isn’t enough, use OUT ProWash Odor Eliminator to keep your laundry clean and smelling FRESH. ProWash is uniquely formulated to reach deep to remove tough odors, including perspiration. Our exclusive formula eliminates the odor instead of masking with fragrance. ProWash is an effective detergent for workwear or workout clothes and other hard to clean fabrics as it delivers a powerful clean. ProWash keeps laundry smelling fresh, without sacrificing fabric performance. How Often to Use: Use OUT ProWash with every load of laundry, as a stand alone detergent or to boost your favorite detergent. Non-Compatible Surfaces/Materials: OUT ProWash can be used on any machine or hand-washable fabric including cotton, fleece, Lycra, microfibers, polyester, spandex, wicking, washable wool and more. Performance Guaranteed. All of our products have a money–back guarantee, promising that every product will meet or exceed your expectations. If you’re not satisfied with product performance, mail your register receipt along with UPC to Summit Brands for a full refund. May be used as a detergent or as a booster with regular detergent. Safe for use in all washing machines and for use with all washable fabrics. Pre-Treating: Rub a small amount directly on the stain before washing. Always check an inside seam for colorfastness prior to treating stains. Washing: The exclusive formula works in both regular and high efficiency washers. You can use it as detergent alone or add it with your favorite detergent for an extra boost of cleaning and odor removal. Do not mix with other chemicals, including OUT White Brite. May be used with normal laundry detergent. For more product information, see our Safety Data Sheets (SDS). 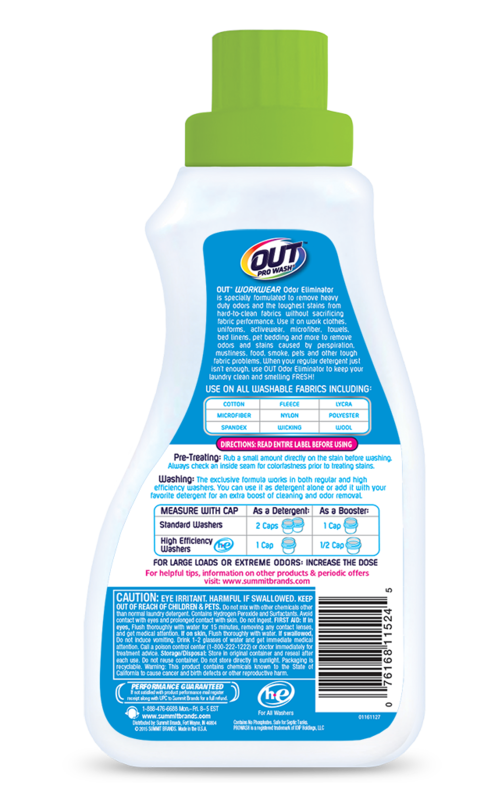 + What does OUT® ProWash® do? OUT® ProWash® Workwear Odor Eliminator Detergent is specially formulated to remove heavy-duty odors and the toughest stains from hard-to-clean fabrics without sacrificing fabric performance. It can be used on work clothes, uniforms, active wear, microfiber, towels, bed linens, pet bedding and more to remove odors and stains caused by perspiration, mustiness, food, smoke, pets and other tough fabric problems. When regular detergent isn’t enough, OUT Pro Wash will keep laundry clean and smelling fresh. + Where can I purchase OUT ProWash? The Summit Brands product line is available for purchase through national retailers, both in stores and online; some products may also be available for purchase through our website. Use the “Where to Buy” button to locate online and local retailers who carry this product or begin your purchase through the site. + What type of fabrics is OUT ProWash safe for use on? 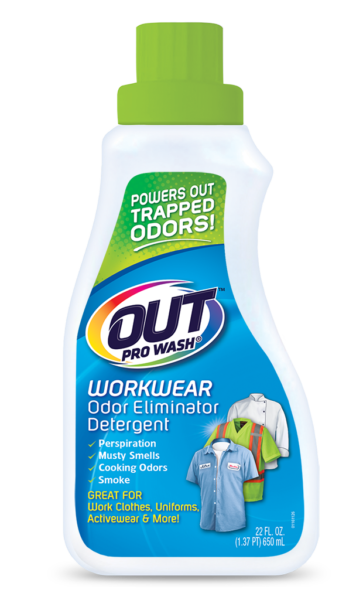 OUT ProWash Workwear Odor Eliminator Detergent is recommended for use to remove odors and stains from all washable fabrics including cotton, fleece, lycra, nylon, microfiber, polyester, spandex, wool, wicking clothing and more. + Why is it necessary to have the warning statement on your label? The State of California requires us to put this warning on the product label for trace amounts of Proposition 65 listed ingredients in our product. No other state has a list like this and they do not require a warning statement on the product. + Is OUT ProWash safe to use? When used as directed, OUT ProWash is safe for use in all washing machines and will not harm washable fabrics, plumbing or septic systems. + Does OUT ProWash use enzymatic ingredients? OUT ProWash does not contain enzymatic ingredients. + Can I mix OUT ProWash with detergent? OUT ProWash is designed as a booster for regular detergents, and can also be used by itself for cleaner, fresher laundry. OUT ProWash should not be mixed with bleach, other chemicals or detergents containing bleach or oxi. + Will using OUT ProWash often cause my clothing to wear or discolor prematurely? OUT ProWash is safe for all washable fabric and does not attack the clothing fibers like bleach. + Can I pretreat clothing with OUT ProWash? OUT ProWash may be used to pretreat stains; however, the fabric should be tested in an inconspicuous area, such as an inside seam, to avoid bleeding or discoloring. + Is OUT ProWash septic safe? When used as directed, OUT ProWash is safe for all plumbing and septic systems. + Can I use OUT ProWash to clean something besides clothing? 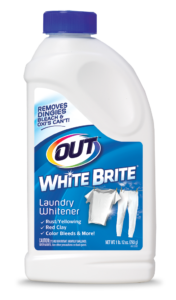 OUT ProWash has only been tested as a laundry odor eliminator and detergent.